Several years ago, I purchased an LG Washer and Dryer and I absolutely love it. It does a great job of taking care of my laundry for my busy family of 4. However, a couple of weeks ago, I had a problem with my dryer and I panicked. I had been washing bedding and for some reason the dryer stopped heating. Turns out, it wasn’t the dryer itself but that the breaker had tripped for some reason. It scared me though because I depend on my washer and dryer on a daily basis and I am not willing to settle for an off-brand. After having the LG brand, I honestly wouldn’t consider anything else. The LG brand may be a little pricey but it’s well worth it. Plus, from time to time I see great deals from retailers such as Best Buy. 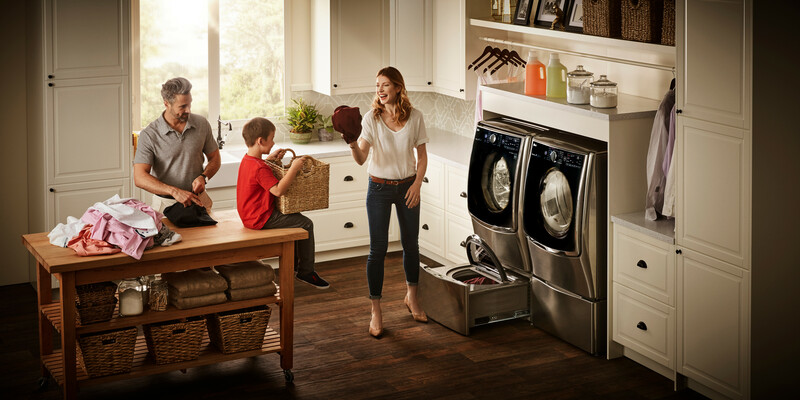 Currently, they are offering up to $500 off an LG Laundry Solution for your home. My favorite feature: It’s truly the best of both worlds. It offers the ability to do larger loads on the top part of your LG Front Load washer while doing smaller loads on the LG Sidekick pedestal washer. It’s great for doing those side loads of gymnastics clothes or messy baby clothes from the daycare. Not only do these washers have mega capacity to tackle any size load, they are energy efficient while giving you the best cleaning performance. With a combined capacity of up to 6.6 cu. ft., the TWIN Wash boasts an ergonomically elevated and angled door that makes loading and unloading easier. Plus, the LED control panel is located on the door, right at your fingertips. No wonder more households have chosen LG laundry solutions over any other brand! Many of my friends have purchased the LG brand and are just as hooked as I am. With a combined capacity of up to 6.6 cu. ft., the TWIN Wash boasts an ergonomically elevated and angled door that makes loading and unloading easier. Plus, the LED control panel is located on the door, right at your fingertips. The deal: From 1/11-4/25 receive up to $500 off a LG laundry solution for your home at any Best Buy retailer.